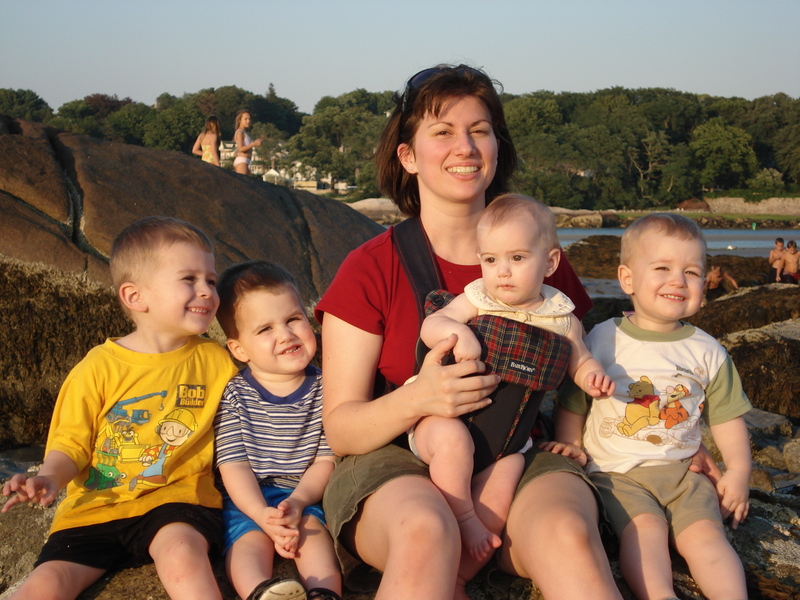 I am a mom of four precious little children: three boys and one girl, all one year apart from each other. Is it okay for him to keep sucking his thumb? When should I put him in a bed? Is it normal for him to be walking around on his toes so much? … but answering these questions from a common sense perspective. As a psychology and education student, I was always concerned that the answers I was receiving were being more informed by ideology than values. A lot of times what I read or heard sounded ok but bothered me in theory. I was skeptical that it would produce good fruit. I was always especially bothered when I couldn’t find answers to my questions, or if my friends’ answers contradicted themselves. To be honest, a lot of what I wanted to know was silly, now that I look back on it. But at the time, it sure didn’t feel that way! 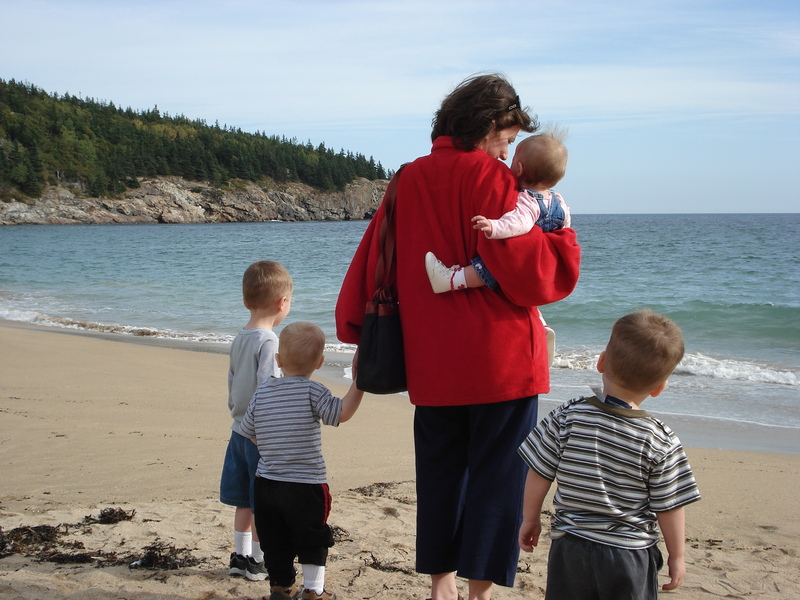 It didn’t help that I lost my own mother to cancer just before my first baby came, and that the best mothers I wanted to emulate were either too busy to talk much, too remote to learn from, or were confined to a book! What I really needed was a good, live-in, scholarly grandmother. To make it worse, my first son struggled with language comprehension and was finally diagnosed with an auditory processing disorder when he was three. Because language is so central to child development and bonding, he and I were really suffering to connect. I had a lot of concern that adhering to customary childraising techniques would hurt him because they relied so much on normal child development—especially good verbal skills. And yet I was also afraid to trust outlying advice because it seemed to completely neglect the moral training of the child. Indeed, when I sent my son to the public preschool out of despair, I was so disappointed. I had recently finished my Masters in Education, so I felt like I betrayed myself. They told me he had all kinds of problems, slapped a PDD-NOS label on him, and said he’s probably fail by third grade if he wasn’ t on an IEP. When my second son was diagnosed with a sensory processing problem, I was wise enough to skip the preschool option but still had few viable alternatives. So this blog is the record of my journey to raise my little children with my own conscience and intuition for the last season, yet while being informed by standard science and educational pedagogy. It will be a work-in-progress for quite some time, so feel free to comment or question wherever you’d like. It will address problems I’ve worked through, questions I’ve asked, and areas I am still concerned about—from family planning to pregnancy, birth to preschool, and especially the intersection of child development and education (i.e. including healthy special education, for high functioning kids). Some articles are very practical and even silly… What type of sippy cup is best? Do I need to buy a Pack ‘N Play? Others are expressions of my heart cry to God in areas where I’ve struggled… How do I reach a toddler whom I don’t understand? How do I discipline? What will help my son talk better? Especially where reading more things in Barnes & Noble or the Internet proved disappointing, unwise, or more confusing, I focused more attention. I have many posts on boys and speech development, and autism, due to the current scare. I am also including some practical resources like ideas for preschooling at home, books I love, and lists of meals and equipment I have found most helpful while deep in the swing of things. My hope is that wherever your are in your journey with young children, that you will find something to help. And if your child happens to be struggling with one of the disorders my children do, and my testimonies can help you navigate or avoid pitfalls I fell into, then even better. I pray that God will spare even one mom the pain that we as a family have gone through, trying to weigh literature and advice from doctors, specialists, schools, and media. Also, my hope is that even though I will share my own perspective, that you will gain the freedom of conscience as a mom to make your own decisions. I have some principles I believe I stumbled upon myself, but ultimately it is up to every mother to discover within herself the courage to take into account the unique feelings, needs, beliefs, and special situations of the family she is molding… and still feel submitted to common sense. I believe the current generation is being robbed of this courage. Happy reading! I look forward to your feedback! Can Christian Dad’s read this blog too? How wonderful of you to share your experience, knowledge and heart. What about us single guys? I am looking forward to reading your blog on a more daily basis, I just came upon it and I’m sure I’ll enjoy your posts. Best wishes to you in your endeavors of being a mom to four little people. I myself have five, 8, 7, 5, 2.5, 6 months LIfe can be very challenging. I’m trying to balance the whole, taking care of the kids, running the errands, and keeping the house clean– which it never seems to be. So I’m still trying to find my routine of what works for us and to get my kids involved. Somedays just make me say — AAAGGGHHHH!!!! When can you test for auditory processing? My son’s speech therapist sent us to an audiologist to test for it and we were turned away because the tech said they couldn’t test for it until age seven. Hiya, what a lovely site & a great idea! I am a full time mum (while my hubby works full time) to 4 children aged 6, 5, 4 and 2, also 6 weeks pregnant with number 5 (unexpected but happy). I am so impressed with your blog 🙂 I feel tired as a stay at home mom with just one toddler (15 mo) and you have four children! You are amazing! I wish you and your family all the best, always. Thank you so much for your blog!! I am in a similar boat! Our first four boys are one year apart, and I am due with our fifth boy in August, which puts him 15 months younger than my fourth son…. I’ve enjoyed reading several of the articles here! Hooray for common sense! I only have two, but can relate to your challenges so well. I just left a message on your schedule post for toddlers and just wanted to add with regard to you being in education and yet struggling to provide readiness to your preschooler’s language development and processing, I am a speech therapist (well experienced in birth to 3) and while I have what seems to be a high functioning receptive language toddler, he has really taken his time expressively. His words are not nearly as present and fluent for a two year old as I would like (and envisioned). It has been humbling. I am sure you can relate in this. I find so much joy and hope in reading your blog/messages to see how God is lifting you out of this pit of defeat and pity and is really giving you so much hope and purpose by just being real with your experiences and struggles. I’m a stay at home mom presently and have really struggled with a thyroid disease and depression and can relate with you so much. I pray His blessings on you as you continue to shine for His glory and that He will continue to give you wisdom as you raise your beautiful family. I hope to be able to keep up with you. Best wishes indeed!! To start with, when I saw your picture, it shocked me. This is because I came upon your site very randomly (I’m doing a reflection/research project on autism for my education program and came across the word “echolalia” and googled it – you were the third hit), and I think we may live in the same area. Anyway, as stated, I’m an education student and student teacher next semester. I’m also a mother. 🙂 My little brother has auditory processing disorder. All of these commonalities I found strange, but they’re probably not as educators, mothers, and kids with exceptionalities are quite normal. 🙂 I look forward to reading your blog and learning. How do I get into contact with the author of this site? The site is a great resource for parents! I’d like to use the text of one of your posts as an info-graphic, can I get your permission? My son is 26 mths old. He knows 3 words. I have seen 2 speech pathologists. The last one has diagnosed him as having moderate delay in communication skills, and severe delay in comprehensive skills. She wants him to see a psychologist (at 30 mths of age). Should I be so worried as he has just turned 2? I know you have advised that some boys peak at 3 yrs of age, but as he has been diagnosed already with these “delays” I’m not too sure what to think. I would like to communicate with you….we have a 9 year old recently diagnosed as we had suspected with CAPD, decoding and integration…and a strong suspicion of it in the 4 year old. Thank you for your blog. Your words have been a blessing from heaven for me. My son is 3 years and 3 months old and currently very behind in speech and understanding. Doctors, teachers, speech therapists just want to put a label on him without listening to us his parents. Your blog has really helped me and I hope that God blesses you and your family for the kindness you provide. Please do keep writing and please can you let me know if I may email you. I have read thousands of articles and books, prayed about a million prayers and talked to countless people about what was wrong with my 2 year old son. Late last night I stumbled onto your blog and finally that weight that has been on my chest since before he was born lifted. You may not know this, but you have saved my life, my relationship and my sanity. Such common sense advice is priceless to me, a first time mom. I have been literally terrified that my son was autistic. Every toe walking step that he took was like a dagger in my heart, every time he built a block tower over and over again, I would stop breathing.IT had become so bad that i struggled to sleep at night. Thank you for peace of mind and the gentle, “snap out of it slap” in your words. I realize that I am missing my son’s life and moments that I can’t get back with worrying. The next time he builds a block tower, I’m getting on the floor to build one too, over and over again. I am adding you to my list of special people that change the world, without even knowing it. Why don’t you blog anymore? I’ve enjoyed reading! Hope ypu start writing again! I love all your posts very educational and helpful. I stumbled upon your blog today as I was searching for articles on scheduling for toddlers. I so look forward to reading more. I found your post to be insightful and intelligent. Thank you for writing so thoughtfully. I have a masters in music, and being at home makes me feel like my brain is going mushy some days, but you have inspired me. I will likely have some follow up questions for you very soon!